The DELUXE Sky Twister set come with everything you need for THREE launches! When we say everything we mean - motors - wadding - batteries - glue, too! The latest edition of Sky Twister has a colour scheme that is hard to lose in the weeds. 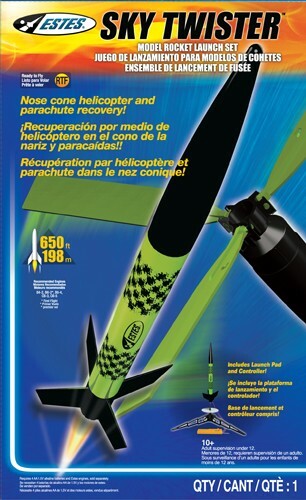 Launch it over 650 feet and watch the helicopter nose cone spin its way to the ground as the body tube floats gracefully down with a 12 inch plastic parachute. If you are new to model rocketry, click HERE to watch a slightly hyper US promo video for Estes model rockets. 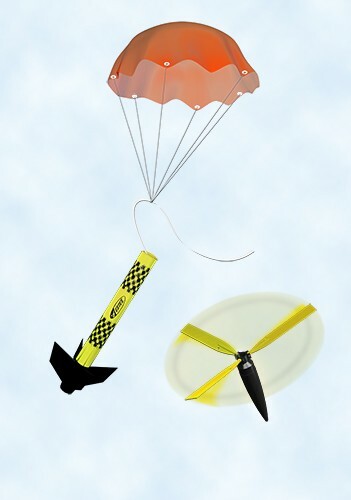 Our optional full-on Recovery Upgrade Kits provide the highest level of durability with nylon ripstop parachutes. They are principally for rocket builders that value the time and skill they put into their birds. Starter Set Upgrade Kits use a standard Estes polychute.